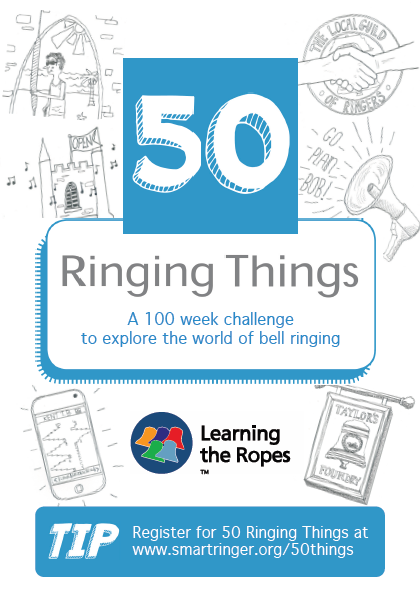 50 Ringing Things encourages you, whatever your age, to experience a wide range of ringing activities. In doing so you will meet and engage with more experienced ringers and your ringing will benefit. You will also gain an insight into different aspects of ringing and its culture. Bronze, Silver and Gold certificates will be awarded for completing 15, 30 or 50 Ringing Things respectively. If you complete 50 Ringing Things within 100 weeks of registration you will be eligible to be awarded a Gold Plus certificate. You can apply for your certificate through the SmART Ringer website. For the Gold and Gold Plus certificates an ART Member, your Tower Captain or a Guild Official will need to sign off your logbook (inside back cover). The names of certificate awardees will be published on the SmART Ringer website, ART Newsletters and other media. Do share what you are doing as you progress through the scheme with other participants and ART Members. You can use the SmART Ringer blog or the 50 Ringing Things Facebook group for write-ups and photographs. Your 50 Ringing Things logbook could be used as part of a submission for an ART Award. If you are a new ringer, particularly if you are under 18, you should discuss with your Tower Captain about having a mentor who can offer guidance and practical help.